I mentioned yesterday that we had a baby shower this weekend and got a bounty of gifts. 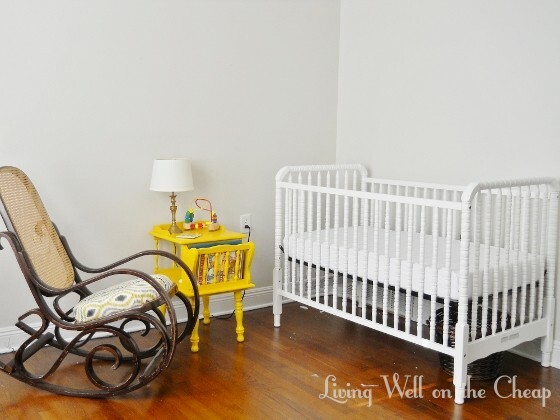 Here’s what the nursery looked like once we got all our new stuff home. It’s like Babies R Us exploded in here. Sunday morning Nick and I went through it all, removing packaging, finding homes for everything, and testing out some of the more hands-on gear with our pets (Pistachio took a ride in the Baby Bjorn while Juliet got swaddled). Once we got the room put back together again we got to the really exciting part–assembling the crib my parents got us! I was so excited that I set up my computer’s webcam to take a time lapse video of the assembly process. I’m pretty sure this is my first video appearance here on the blog. Very exciting stuff. I still need to make a crib skirt for some concealed storage underneath. If you look closely you can see that I’ve already stashed a basket under there with things that we won’t need for a little while (bibs, sippy cups, etc.). Here’s a little bit wider angle where you can see a bit of the dresser (with drawers still ajar from organizing all those teeny tiny clothes). The crib packaging was still all over the floor but we’ve since cleaned that up. Now I get to move on to the really fun part of adding some color and interest to the area with a crib skirt, mobile, and artwork. I’m soooo excited to have the crib put together. Every time I look at it I get this big goofy smile on my face because it just makes it seem so much more real that THERE’S A BABY COMING!!! That’s where he’s going to sleep! There is a baby crib in our house. That’s nuts. How exciting! I know the feeling. Not much longer now. Hang in there. I remember when I was expecting Timothy and we already had a baby crib for James. There were 2 cribs in the room! A visual makes it all real. Your love bug will arrive before you know it! You and Nicholas need to take one last break/get away before little bit comes. I can watch Juliet. The Grand Hotel in Alabama for a weekend would be perfect! Wow! You got a lot of stuff! I love the crib! The nursery is really coming together.